The Seth Mokitimi Methodist Seminary has its roots in early Methodist ministerial training in Queen’s Town, Cape Town and later at Wesley House, Fort Hare. The extension of Bantu Education to Black Universities saw the Methodists leaving Fort Hare. They continued their training at the Lovedale Bible College, and in 1960 joined other Churches in establishing the Federal Theological Seminary. This was built in Alice at a site identified by the Rev. Seth M. Mokitimi, who chaired an Ecumenical delegation comprising representatives of the Anglicans, Methodists, Presbyterians and Congregationalists. Seth Mokitimi had long been involved in efforts to provide Black people with good education. Born in Lesotho, as a young Methodist Minister he served as Housemaster of the Healdtown Methodist College when the late Mr. Nelson Mandela was a student in 1938. 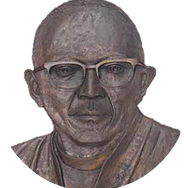 An Ecumenist, he subsequently rose to become the President of the Methodist Church of Southern Africa in 1964, the first Black person to head any of the Protestant Churches in South Africa. It is after him that this Seminary is named. After the Federal Theological Seminary was expropriated and incorporated into the Fort Hare University, the FedSem community moved first to Umtata and then settled outside Pietermaritzburg at Imbali. One of the founding lecturers of the Seminary at Imbali was the Rev. Dr. Simon Gqubule. In 1995, the founding churches chose to dissolve their partnership in theological education. The Methodists resuscitated their old school at Kilnerton and used it for Theological training. The MCSA used the next ten years to reflect on its theological education, canvasing membership, ministers and theologians in order to provide a new kind of education for a post-apartheid South Africa. In the light of this the Seth Mokitimi Methodist Seminary was established by the Conference of the MCSA and building began in 2008, with the first intake of students being welcomed on the 1 January 2009.